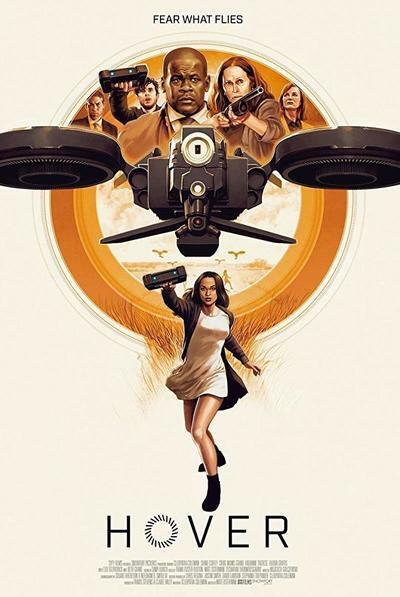 I wanted to like “Hover.” Written by and starring Cleopatra Coleman, its futuristic dystopian milieu is intelligently sketched out at the beginning. Drought has all but destroyed U.S. agriculture. A corporation called Vastgrow is marketing drones to assist those farmers who have livelihoods left. But things are so grim in the country that assisted suicide is now legal, and one of the largest providers of it is a company called Transitions. “Hover” opens in the self-driving car of a couple of Transitions agents, Claudia, played by Coleman, and her friend and mentor John, played by Craig muMs Grant. They banter about John’s frequent “back in my day” conversational digressions, and after a job, Claudia tells John that she’s pregnant—which is the reason she’s been throwing up all day, not out of general and probably job-compromising queasiness. “Is it his?” John asks. It is, she says. “He’s married,” John reminds her. Curiouser and curiouser. But Claudia does not get to reveal her state to the father, Jason, a remote fellow who’s also Claudia’s boss. Before she’s able, he has to tell her, the next morning, that John is dead, and that perhaps he chose to “transition” himself. Claudia doesn’t think that can be, and the audience knows it isn’t, because we’ve seen how John died—attacked in his own home by a drone that caused his head to explode. Produced in part by the Syfy Channel, “Hover” delves into its rural conspiracy plot with some deliberateness; the direction by Matt Osterman keeps things tense for a while as Claudia is distracted by Isaiah (Shane Coffey) a new co-worker whose enthusiasm over a recent surge in “transition” requests strikes her as a little glib. She’s also bothered by her new road-trip partner, Tania (Fabianne Therese), who’s constantly trying to cadge Claudia’s tablet to look things up, even going so far as to go into Claudia’s motel room and try to hack the thing while Claudia’s out. She’s unable to believe that the Vastgrow drones are deliberately killing farmers until she sees it with her own eyes, at which point she finds a new ally—and discovers that someone she thought was on her side was against her all along. All of these nuances, as well as whatever satirical social commentary the movie wanted to make, are lost in the climax, a press conference staged with a threadbare quality that’s sadly typical of too much original Syfy fare. The problem is compounded by the ostensible need to do something bloody spectacular, in this case a drone attack in which lots of people’s heads explode messily and cheesily. I was of course reminded of Big Jim McBob and Billy Sol Hurok of SCTV’s immortal “Farm Film Report,” in which the overall-clad pair sang the praises of movies in which things “blew up real good.” I almost had the feeling that the movie could have been made specifically for them. But I also mourned the death of the more thoughtful movie suggested by the first ten minutes of this.